A petition for a Prince George’s County liquor store to lose its license is gaining steam as video circulates of the owner tackling and handcuffing a customer who knocked down a display. Over 5,000 people have signed a petition demanding that officials shutter Largo Liquors in Upper Marlboro, Maryland. The petitioners were motivated by a video circulating on Facebook showing a customer knocking something off the counter at a liquor store, and employees tackling and handcuffing the customer in response. Video of the August altercation shows a customer approaching the counter at a liquor store. He put his purchase down, and the cashier scanned the items and checked the customer’s identification. He double-bagged the purchase. Then, he made a comment facing the direction of a woman playing lottery nearby. The customer was offended by the cashier’s comments. “You’ve got an attitude,” the customer said. “I don’t have an attitude,” the cashier said. “Calm down,” the customer replied, reaching for his purchase. But the cashier stopped him by putting his hand over the bag. He also refused the customer's cash. Then, he told the customer to take his business somewhere else. “You think you can tell me how to do my job,” the cashier said. The customer turned to the woman playing lottery. “He’s ignorant,” the customer said. The customer turned to leave, took a few steps and then returned. After exchanging more words with the cashier, he pushed a display off the counter. As the customer turned to leave, the cashier and another employee rushed at the customer. The video shows another man, later identified as the owner of the liquor store, running through the store’s front doors and joining the fight. 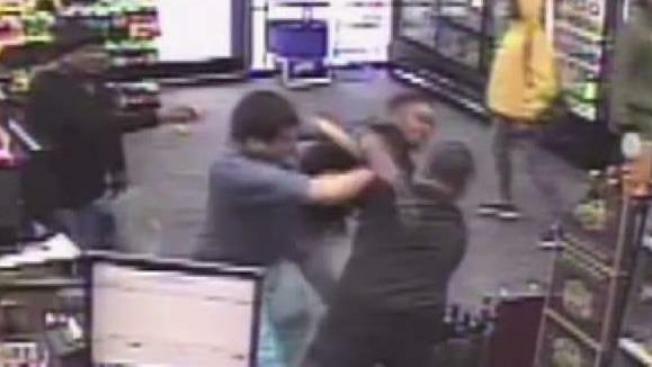 Soon after, with bystanders urging the men to stop, the brawl ended, and the owner held the customer against the ground. “Put your hands behind your back,” the owner said. The customer told News4 he believed the man was a police officer. The customer remained handcuffed until police arrived. Initially, the customer was charged with disorderly conduct, but the State’s Attorney dropped those charges. The owner was charged with second degree assault, and the State’s Attorney also dropped those charges. Prince George’s County police said the owner was allowed to handcuff the customer in his business, and compared it to a citizen’s arrest or a security guard detaining someone. But some people in the community have decided to do more. People have negatively reviewed the store on Yellow Pages and Google. They also gathered outside to protest the store. The 5,000 signatures are more than enough to get the dispute in front of the liquor control board, which requires 10 signatures for a hearing. "It makes me feel like I have a family," the customer said. "A family that I don't even know about." The customer asked not to be named because of his job. The liquor store referred News4 to an attorney, who did not return a request for comment.